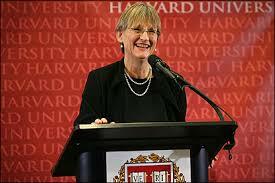 About: Catharine “Drew” Gilpin Faust is the current President of Harvard University. She is the institution’s first female president, and the 28th president overall. Faust is the fifth woman to serve as President of an Ivy League institution. Faust received her Bachelor of Arts degree in history from Bryn Mawr College in 1968. Faust then went onto graduate school at the University of Pennsylvania, earning a Master’s degree in 1971 and a Ph.D. in 1975. She joined the Penn faculty that same year as an associate professor of American civilization. In February 2007, she was appointed as President of Harvard University. One of her biggest initiatives since becoming President has been increasing financial aid for Harvard students.